Well, it’s the wonderful time of the year again! It’s Christmas! So if you like to really pull out all the stops during Christmas time: decorating the house, tree and dining table really. It really lifts the spirits. But what we really look forward to is getting our outfit ready from the shoes to the dress to the hair and… the makeup! If you’re looking for some inspiration, have a look through these tips for holiday makeup ranging from the softly understated to the delightfully dramatic. 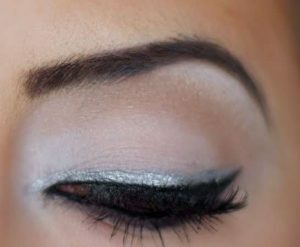 Frosty Sparkle -We love glitter, seriously; and the holiday season offers the perfect opportunity to express that love, icy, sparkly eye shadow look is the perfect touch for a white Christmas. 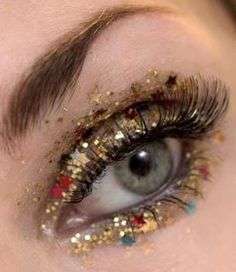 Glitter Cat-Eye -If you still want some sparkle but don’t want it to be quite as heavy as the previous style, just draw a single glitter stripe right above a cat-eye line. It’s a lot more subtle, yet noticeable enough to actually make an impact. Luscious Lips -Use some gold and red metallic pigment on top of your red lipstick for a richer, almost velvety look. Not only does it look great, but it’ll also help set the lipstick so that it lasts longer. 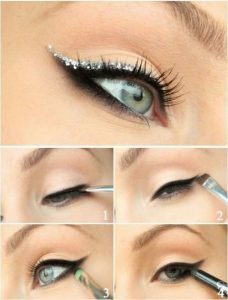 Snowflake Eyes -Use a silver liquid eyeliner with a very fine brush to add some adorable snowflakes to your beautiful smoky eye. 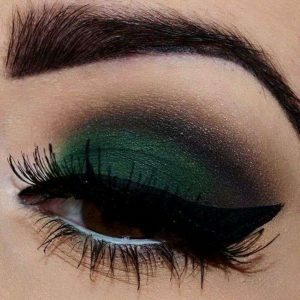 Green Eyes -A simple green eye shadow can make an incredible impression, simply sweep one tone or two across your entire lid. 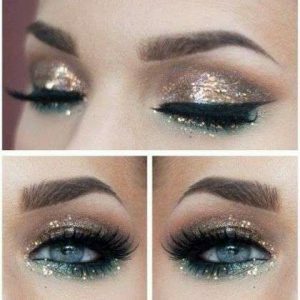 Subtle Shimmer -If you aren’t one for heavy makeup but still want to do a little something special for your Christmas party or dinner then a shimmery look using a matching shimmery eye shadow is the perfect option. The final look is rather demure and looks natural, but gives you that pop that you want. Orange is the New Black -You don’t necessarily have to stick with Christmas colors; an illuminating orange-gold eye shadow makes a bold statement without being too obvious at the same time. There’s nothing more Christmassy than red, green and gold, so why not apply that to your eyes for some truly festive eye shadow? We love how this look incorporates all the colors without actually looking to dramatic or overdone at the end. Neutral Ombre Lips – you’re going to vamp it up with the eyes then you’ll need a more neutral tone on the lips. 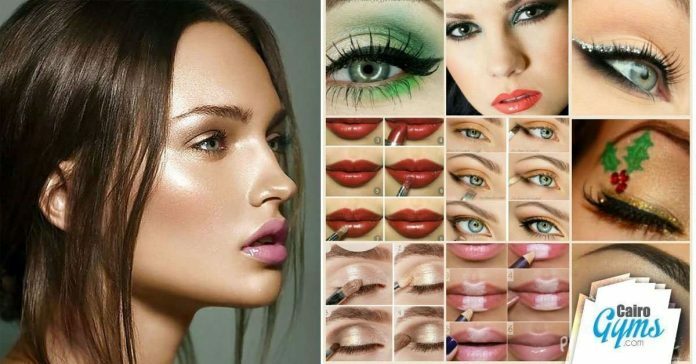 Alternatively, if you want to put the emphasis on the lips instead of the eyes, use the same ombre technique but use a brighter, bolder color. The mistletoe detail is just too cute! Drawing some golden stars adding a small green charismas tree on your eyelid With a steady hand you’ll be able to master it -although you may need a practice round!- Just be sure to keep the rest of the face rather understated so that you don’t look overdone.